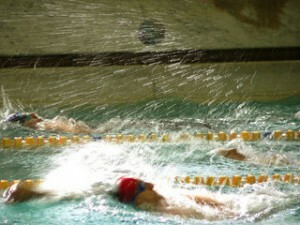 If you coach a swim team, you want your best swimmers in the pool during competitions. To find your best swimmers, you have competitions in practice (or maybe more formal trials) where your swimmers compete to prove who’s the best. And it’s not a one-time thing either. You’ll constantly have internal team competition going on so your best swimmers are in the water at the big meets. Your AdWords campaign is no different. You want people to see your best ads because that’s going to get you more clicks, leads and sales. To do this, you’ll have your ads compete in split tests. In each ad group (an ad group is a collection of closely related keywords in an AdWords campaign) you can have two or more ads running at the same time. To keep things simple, let’s stick with just 2 ads in an ad group for now. In this case Google will show 1 ad half the time and the other ad the other half the time. Using the metrics provided in your AdWords campaign, you’ll be able to see which ad gets the best response. Once you find the “winner”, you get rid of the losing ad, replace it with another ad and start the competition over. Over time it can dramatically raise your clickthrough rates (a percentage that measures the number of times someone clicked on your ad compared to the total number of times your ad was displayed). This improves the results of your campaign by getting more people to click on your ads and come to your website. It also helps raise your Quality Score. Quality Score is basically an algorithm in AdWords that measures the relevance of your ads. The more relevant your ads and the higher your Quality Score, the less you’ll pay for clicks (yet still have your ads potentially rank higher than your competitor’s ads). It’s rare you’ll be able to write the best ads for your campaign right out of the gate. Consistent split testing will help you find the strongest ads and is one of the most powerful ways to improve the performance of your campaign over time. Did you know when you set up an AdWords campaign, your ads don’t necessarily just appear on Google.com? Most businesses don’t…and end up blowing a ton of money on clicks that are very unlikely to result in business. In the next post in this series, you’ll learn how to protect your bank account and focus your budget on the most relevant clicks. Great advice. Sad to say a lot of businesses fail in their PPC campaigns and then tell everyone that PPC is not the right strategy to use. I’ve been using PPC in most of my online campaigns. Very good tool if you want immediate results. Exactly Adam. Much better for us. I think you’re right – enjoyed your article!